A few kilometres south of Win Sein you’ll see a sheer limestone outcrop just to the west of the highway. At the summit is a pagoda with several smaller shrines and caves lining the steep 20-minute climb to the top. The route is mostly concrete steps and if you’ve the energy to get to the summit the views over the surrounding countryside are stupendous. 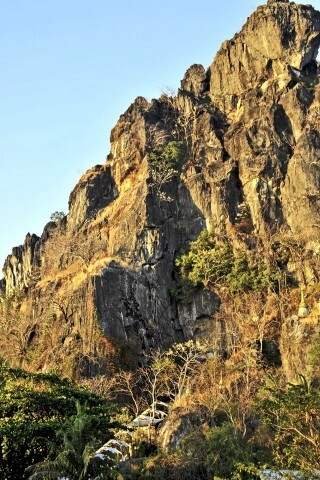 You can’t miss the dramatic crag amid the flat farmland and 500 metres or so of dirt track off the main highway will bring you to the foot of the mountain. A circumnavigation of the hill provides spectacular views while the start of the staircase lies behind temple buildings on the south side. Directly opposite on the east side of the Mudon highway is a similar outcrop, with this time a Hindu shrine on the summit. It’s not as high and an easier climb, so views are correspondingly more limited. The staircase leads up from the southwest corner, while again a trail leads in a loop around the hill. On the northeast side a narrow tunnel leads into the heart of the mountain where you’ll find a small shrine. When we visited it was actually candlelit but narrow -- not for the claustrophobic and we’re not sure how far the tunnel actually leads. It’s an interesting spot to explore.